Home > Buy in Bulk or Case Lots > Buy in Bulk! > Forever Black Tire Gel Dye 128 oz. Low-shine pigmented gel restores color for months! Forever BLACK silicone-free Tire Gel outperforms tire "dressings". 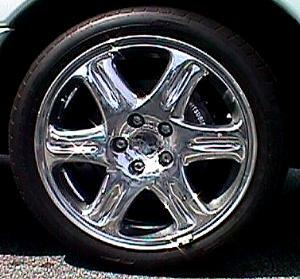 The tires will be restored back to the new black luster look they had when you bought them. Forever Black Tire Gel is a pigmented polymer gel. It will restore the color back to black, and it lasts for months! Forever Black Tire Gel is environmental safe and silicone free. Most tire “dressings” last for days while Forever Black last for up to 30 washes. You will be surprised how different your whole vehicle will look when you apply the tire gel. Your old dirty tires will come to life in one application. The Tire Gel includes a special patent-pending foam applicator. Forever BLACK Tire Gel dries in minutes and lasts for months. Each gallon will dye approximately 160 tires. Safe to use around your paint job since it will not adhere to paint. Forever Black Tire Gel 128 oz. i dont like it,messy stuff and i dont like satin finish on tire. Been using it for years (smalller size) but I love that it does not make your tires "brown" like every other product out there, lasts a looooooonnnng time, and provides a nice satin patina rather than a tacky high gloss shine. And, the dye will cover any blemishes you may have. Great product.